*Pop! 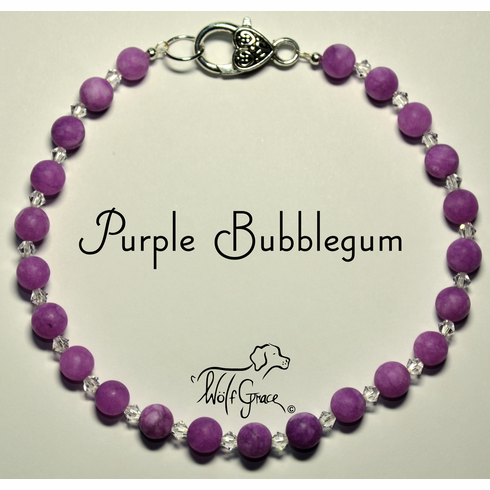 * With the Purple Bubblegum necklace, your dog can enjoy all of the colorful wonders of bubblegum without having to worry about bubbles bursting on their luxurious fur. Much like our �Pink Bubblegum� necklace, this Purple Bubblegum necklace, authentic Gemstone necklace features a multitude of delectably purple 8mm round Orchid Matte Jade beads. You will adore the way that each Jade bead is unique and like your dog, no two pieces of Jade contain the exact same swirls or crackles. The slight natural variation is complimented by the 4mm bicone Crystal Satin Swarovski beads which set off the array of purple explosions. To make sure they don�t roll away, the beads are strung on Sterling Silver jewelry-grade wire. Notice on each end of the necklace, how the Sterling Silver crimp covers reinforce and conceal the Sterling Silver crimps, which hold the beads securely in place.